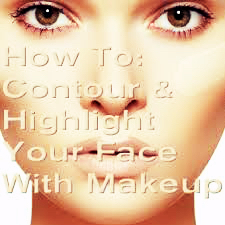 All About Your Face Shape & Contouring Like A Pro!! 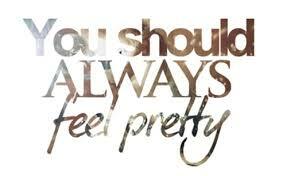 Each face is individual and the features that make up the face are what give it its individuality and beauty. Learning to work with your face shape and features will give you confidence in how you look. 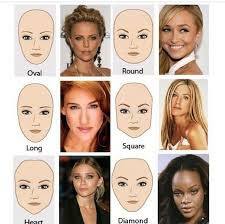 The shape of your face is determined by your bone structure; the most flattering face shape is oval. Once you have identified your face shape, you can use contouring and highlighting to alter slightly the shape your face appears to be. Square Face– A square face has a strong, squared jawline, and a broad forehead. Like a round face, the width and length are in proportion, but the main difference between a round face and a square one is that the corners are more angular than curved. The main areas to contour are the temples and the outer corners of the jaw, and areas to highlight are the center of the forehead and down the nose. Blush should be applied vertically on either side of the nose to soften its width. Long Face– A long face is longer than it is wide. The forehead, cheekbones, and jawline are typically all the same width. To reduce the length of the face, contour on the chin and along the hairline. Highlight on top of the cheekbones and apply blush horizontally. Oval Face– The oval face is considered to be the ideal face shape because of its balanced proportions. The natural angles are perfect for applying makeup. An oval face has a forehead that is wider than the chin, and prominent cheekbones. An oval face can carry all makeup looks. Heart-Shaped Face– The heart-shaped face is similar to oval, being wide at the forehead, but it then curves down to a point at the chin. The chin can be softened with shading and highlighting, and the forehead can be balanced with shading on the temples. Applying blush on the apples of the cheeks will soften the overall shape. Round Face– A round face is youthful looking. The width and length of a round face are in proportion and there are no angles. The cheekbones are hidden by full, wide cheeks. To enhance the appearance of a round face and use contouring and highlighting techniques and apply blush on the underside of the cheekbone at a slant. Round Face– Contour a round face to make it seem more oval. Shade from the hollow of the cheek to the jawbone along an imaginary line from the corner of the mouth to the top of the ear and the side of the forehead across the temple. A characteristic of a round face is plump cheeks, which hide the cheekbones, so use a darker shade of contour blush as it is harder to define this face shape. Square Face– A square face has a solid jawline and unnoticeable cheekbones. To soften the jawline, contour under the cheekbone down to the jawline from the middle of the cheek back to the ear. Also, contour the outer corners of the forehead above the temples, creating more of a rounded shape. To enhance cheekbones, highlight on top of them. Long Face– Apply contour powder or foundation two shades darker then the skin tone onto the forehead close to the hairline, under the cheekbones on the lower part of the cheeks, and across the bottom of the chin slightly above the jawline. Then apply blush directly on the cheekbones and highlight above the cheekbones and on the temples. Heart-Shaped Face– Apply contour powder or foundation two shades darker than your skin tone to the temples and chin. Then apply highlighter to the lower cheeks on the jawline and blush directly on the cheekbones. Oval is considered to be the ideal face shape. To alter how your face appears, use a combination of contouring, highlighting, and clever blush application. – To contour, I would recommend using matte blush or foundation two shades darker than your skin tone. – Highlighter can be either foundation or concealer that is two shades lighter than the skin tone, a matte powder, which could be a matte eyeshadow; or a cream highlighter. – Always make sure that all the edges are blended well and there are no hard lines. Previous postHow to Shape Your Brows!! Next postHow to Enhance Eye Make Up!! !